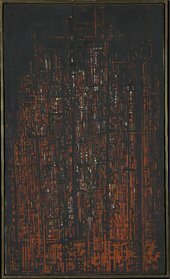 In 1956 Norman Lewis’s Cathedral 1950 became one of the first works by an African American artist to be shown at the Venice Biennale. Cathedral is an oil painting on canvas that was made in 1950 by the American abstract expressionist Norman Lewis (1908–2003). It is one of a small number of colourful, densely packed abstract compositions Lewis made which have titles that refer to the architecture of Harlem, New York City, where he lived and worked. Cathedral was displayed in the exhibition American Artists Paint the City in the US pavilion at the 1956 Venice Biennale, where it was hung with other abstract works by Jackson Pollock, Mark Tobey and Lyonel Feininger. This was the first show at the Biennale to include works by African American artists since its founding in 1895. This In Focus offers a new look at Lewis’s relationship to the history of expressionism and abstract expressionism by comparing his use of light and space in Cathedral to that of the older German-American artist Lyonel Feininger (1871–1956). It discusses the crucial but under-studied role that American Artists Paint the City played in opening up American abstract expressionism to European audiences. It examines Lewis’s participation in this show with regard to the large-scale global biennial as an exhibition platform in the 1950s. Finally, it reveals how Cathedral was tracked down for sale at auction in 2015 as part of a revival of interest in Lewis’s career. Published in October 2018, the project is authored by Andrianna Campbell (City University of New York) with contributions by Raffaele Bedarida (Cooper Union) and Claire Brandon (Ivorypress).